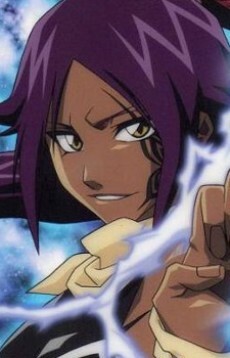 Yoruichi Shihouin is an attractive, dark-skinned woman who can transform into a black cat for long periods of time. She is intelligent and witty, and is intimately knowledgeable of Soul Society and its workings, as she was the former leader of the special forces. Although of noble birth, she acts differently from other nobles. For instance, she instructed Soifon to refer to her without using honorific suffixes. She also transforms into her human form directly in front of Ichigo on several occasions just to see his reaction to seeing her naked. Yoruichi tends to avoid battles, preferring to help after a fight is over, but she will step in if she thinks her side cannot win. She was responsible for training Chad and Orihime prior to their entrance into Soul Society. She also supervised Ichigo Kurosaki's final release training using the methods developed by Kisuke Urahara.